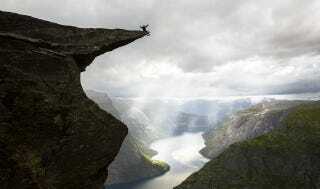 Trolltunga is one of the most spectacular cliffs in Norway. More than half a mile above the ground, the views are breathtaking. But to enjoy those views for yourself you need first to be in shape—it takes a five hour hike to get up there—and then, obviously, to not be afraid of heights like I am.